Be Thankful. Be Creative. Be Colorful, and Just Be! Giving Thanks. November is the month of being “thankful” for all we have in our lives. I would like to express here my heartfelt thanks to you, my fellow followers. To the friends and family who inspired me to follow my dreams, to the bloggers out there reading and liking my posts and sharing their passions, to the mysterious rocks stars (fake or not) taking an interest in little ol’ me, and to the people in the plant world providing me with great networking opportunities, and to the artists offering their talents as guest speakers, and to many, many more, I say today, Thank you. Thank you also for posting your reviews and testimonials. This morning I was looking over my stats on my blog. Currently, I have 73 WordPress followers, a total of 522 Facebook Friends liking my pages, 60 email followers, and 197 Twitter followers. It wouldn’t be right to say I have a total of 852 followers because some are the same people on one or the other platform, but roughly its somewhere about 600+ people. I’ve always said too, it’s not the number of, but the passion of the followers which truly counts – and people who follow this site enjoy container gardening, art, and plants probably as much as I do. Each and every one of them is important to me because of their similar passions and interests. Followers of this blog receive an update in their WordPress Reader (which is a special background page for WordPress users), via email, or both depending on their settings each time a new post is added. For social media, they are notified of posts in their feeds. Getting new content quickly (as it is posted) is beneficial, especially for hot topics and new workshops on the horizon being offered by Container Crazy CT.
WordPress followers have a blog of their own on WordPress, as opposed to followers which may be from Facebook or Twitter. As noted above, they get notified in their “reader” when they follow another WP site. Sharing is caring in the world of bloggers and blogging, so one of my goals is to share posts by my fellow WP followers on this blog on a routine basis to spread the love and the information, as they share similar knowledge, ideas, interests, tips, and more. 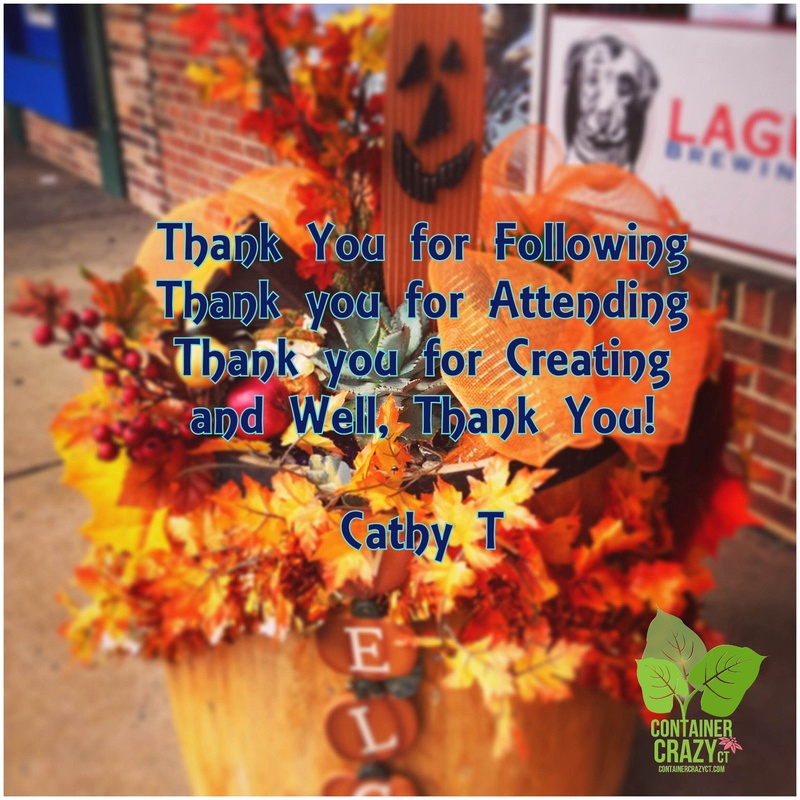 Thank you WordPress Followers – I’m following you too! For my connected social networking services (such as Facebook or Twitter) through my blog’s publicize feature, it shows that I have 301 followers on my Facebook page for Cathy T’s Landscape Designs page, which means there have been a total of 301 Page Likes for it. Cathy T’s Landscape Designs’ page is where I originally started my business about container gardening and garden designs, among other services. It is the official name of my business, but over the years, my services focused on all things container gardening and exotic tropical plants, and a bit less on landscape designs. This is why I also have a Container Crazy CT Facebook page, which more suits what I currently offer in the world of container gardening and hands-on workshops. This page has a total of 221 Page Likes as of this writing, and seems to be growing. If I could only merge the two Facebook pages together for a total of 522 Page Likes! Some are the same people, but no matter, it is all good – and it warms my Facebook soul to have them participate on my posts with their comments about their container gardening passions too. Thank you Facebook Friends – Love hearing from you and seeing you every day. Currently, my Container Crazy CT site has 60 email followers. These primarily consist of clients, workshop attendees, artists or bloggers, networking contacts, and anyone else out on the web that came across my blog and decided they wanted to keep in touch by receiving a post each time it is published. If you want to receive instant notifications as they are posted, this is a great way to not miss a thing, especially upcoming speaking engagements at garden clubs and the workshops offered related to combining nature with art or container gardening. Thank you email friends – I know how email can pile up – and I hope you enjoy receiving the updates regularly! As of today, I have 197 followers on Twitter. A big thrill was when Martha Stewart started following my Twitter feed last winter. And, recently, Dr. Allan Armitage started following me too. Both are rocks stars in their field of work and study. While it may not be the “real” Martha, and maybe Dr. Allan Armitage has a helper for his social media feeds, it is cool to me – especially because Martha is in the world of all things fun for design and crafts, and the Dr. Allan Armitage is a Horticultural specialist. These two facets are what I love in my world of business offerings, that is combining nature with art. If it isn’t really them, I still will enjoy fantasizing that it is. If it is really them – Thanks!!!! Oh and Don’t forget my Instagram and Pinterest pages. More on these later!